Though he died just short of his 85th birthday, Salvador Dalí was the eternal evil teen; his pronouncements and gestures were designed to startle his “audience” — the World! Dalí seemed sure everyone, everywhere watched him with unflagging fascination and cared what he said and did. Perhaps Dalí’s attention-grabbing ways masked deep insecurities; one wonders if the weird, cruel, inexplicable opinions Dalí proclaimed were true expressions of his heart and mind, or only empty words intended to shock and awe. Did Dalí really “spit for pleasure on the portrait”1 of his dead mother; applaud the murder of his friend Federico García Lorca (“The moment I learned of his death…I cried 'Olé'!’”)2; and support Franco's torture and killing of dissidents (“Three times more executions are needed…. Personally I’m against freedom. I’m for the Holy Inquisition.”)3? What type of perfume would Dalí have created? I imagine him saying something like: “Doesn’t everyone love the scent of blood and dung, sweaty breasts, fuzzy tongues and turtle shells, lady bug shellac and horses’ milk!? Let’s bottle the scent of desperation, the aroma of time running out.” (Actually, that sounds more like García Lorca than Dalí!) Dalí did say, "Of the five senses, the sense of smell is incontestably the one that best conveys a sense of immortality.”4 Dalí, always looking for ways to make money, signed a licensing agreement with Jean-Pierre Grivory of COFCI (now, Cofinluxe) in Paris on Dec. 17, 1982, and the Salvador Dalí brand was born. Dalí designed the company’s bottles (seen above); they represent Aphrodite’s nose and lips from his painting Apparition of the Face of Aphrodite of Knidos (image below, left). I have a hunch Dalí would have loved strange, man-made, contemporary fragrance accords (even though his personal perfume preference was a dab of jasmine oil behind each ear), and I wonder if he would have appreciated Laguna (1991) if he had lived to smell it? Laguna was created by perfumer Mark Buxton and lists notes of iris, lily of the valley, rose, pineapple, ambergris and vanilla. I can smell all of those (blatantly synthetic) notes if I strain my nose (‘pineapple’, ‘ambergris’ and see-through ‘vanilla’ stand out), but overall Laguna’s notes seem blended by a hurricane: a "blur" of slightly sweet aromas melding into a watery, fruity, sheer floral concoction, light and airy, but with good lasting power on skin. I don’t find Laguna too feminine for men; the dry-down of ambergris and vanilla (and a note that smells of fresh white bread sprinkled with sugar) sounds heavy but the perfume is “jaunty” — a good choice for warm-weather (and post-exercise) anointment. Though Laguna aims for a marine-beach-y, outdoor vibe, there are no obvious Calone/ozone notes present. The “shocking” and innovative spirit of Dalí is exemplified more by Comme des Garçons and État Libre d’Orange than Parfums Salvador Dalí, but I’m curious to smell other fragrances in the line. (I won’t feel guilty either; Dalí isn't collecting any royalties these days!) For buying information, see the listing for Salvador Dalí under Perfume Houses. 1. Lorca: A Dream of Life, Leslie Stainton, Farrar, Straus and Giroux, 1999 (hardcover edition), p. 205. 3. The Shameful Life of Salvador Dalí, Ian Gibson, W.W. Norton & Company, 1998 (U.S. hardcover edition), p. 619. 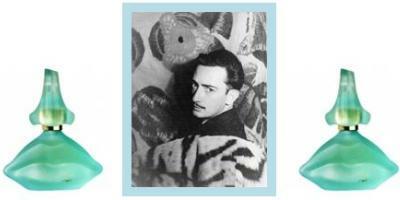 Note: top center image of Salvador Dalí (1939) by Carl Van Vechten via Wikimedia Commons. Wow. Laguna sounds shockingly typical and normal. Maybe therein lies the shock. One expects something divisive and slightly off-putting, and we’re given a fruity floral. Almost like a “Gotcha!” from beyond the grave. It seems in this case that expecting the unexpected is entirely appropriate. Thanks for the fun review, Kevin. Great review, as always. I used to wear a Dali perfume (it was the only one I knew of at the time–I think it was just called Salvador Dali?) when I was in college. I loved it then, who knows what I would think of it now. HA! But it’s true…apparently he could not keep his hands out of his,a’hem, pockets! Stay away from the reformulated Salvador Dali: it’s dreadful – sharp, sour, blech. I used to wear it too and loved it. All the wonderfully warmth is gone from it now. The original Dali fragrance was a really nice rich oriental. I bought a mini of it when I was in high school! I wore it off and on through HS and college and never really thought about it again, though now I wish I had bought and kept a full bottle of it. Since I haven’t smelled it for about 20 years (!) I can only recall very vaguely that it was warm and rich and I thought the bottle was very cool. I received it with mini’s of Paloma and Deneuve, so it was in with some heavy hitters. I am sure it would be a wallop of an oriental compared to today’s standards. I see it online occasionally, but I fear that it has most likely been reformulated and am not interested being disappointed. Oh, and I forgot to add… after reading some of his personal papers while I was in college, I think that Dali would be attracted to such fragrances at MH L’Air du Rien, FM French Lover, etc… he liked to put on a great facade of his attraction to perversions, or he really was. In either case, his overall image is one of excess and shock, so I think that anything with that rough body edge to it would work for him. Raw civet? Who knows? Maybe he was just a powder puff covered in black leather and a wax mustache? in many photos it looks like if someone said “BOO!” to him, he’d faint..so who knows!? “Wax Mustache” would’ve been a good name for one of the fragrances. Let’s try and imagine that bottle, lol!!! Anns: 20 years is a long time…but you should give it a try! See my comment above. I made the mistake of sniffing it somewhere. I recoiled in horror. Hi Kevin: I love when you pull things out of the “archives.” Often more interesting than some new releases, that’s for sure. I like the idea of something that conveys beach/outdoors without being ozonic. I’m a bit curious about Laguna now. Also, I’ve had quite a lemming for Dalissime since Pyramus said great things about it a few months back; I need to pick up a mini. I somehow missed that Dali said approving things of the Franquistas; that’s so repugnant to me. I think there was a very recent movie about Dali & Lorca; I don’t think it got great reviews, but I’m curious to see it. Totally unrelated to fragrance, but Joe your comment makes me think of two movies I really enjoyed that dealt with the ugly side of the Franco regime through the eyes of children: the most excellent Devil’s Backbone and also Pan’s Labrynth. Both are by Guillermo del Toro and are really something to see. I love Pan’s Labyrinth, Ann. Devil’s Backbone didn’t grab me for some reason, but maybe I’ll check it out sometime. I liked Pan’s Labyrinth better too – that little girl’s character is so compelling. Similar themes and time period, but different country: Malena, with Monica Belucci? Such a good, yet hearwrenching film! From the eyes of a young italian boy/man. Ok, just ordered minis of Laguna & Dalissime. HA! Report back to us. I’m kind of tempted to buy the one I had when I was in college… a little afraid it might bring back memories of being in my 20’s, which I can live without. Dalissime is enchanting–a gorgeous, wonderful fruity floral oriental, created before that category become so inescapable and hateful. I adore it. Laguna, not so much. I kind of hate it, actually. My experience of it is not at all like Kevin’s description, or anyone else’s. The original Dali, though: I started wearing it in 1984, when it was launched, and 25 years later am still not tired of it. It was the scent that made me realize I wasn’t restricted to the men’s side of the aisle. I bought a mini of it a couple of years ago and, amazingly, it hasn’t changed a bit: they didn’t reformulate it, and it’s as potent as it ever was. Rich oriental, but with a little swirl of wood smoke to keep it from ever getting cloying. Just fantastic. Joe: that movie was directed by Tom Ford, right? It looked a fright. At least get Spanish actors, esp. when dealing with a POET! Do try Laguna…you can get samples easily it seems…and they come inside little plastic nose/mouth contraptions! Tom Ford?! It’s the “Little Ashes” movie referred to by Blimunda below, and I guess the director is Paul Morrison (?). At least the actor playing Lorca — Javier Beltrán — is Spanish/Catalan. I added it to my bottomless Netflix queue. I have NO idea why that came out of my “mouth”…It must have been because I had just heard about Tom Ford and his Isherwood project/movie. But “Little Ashes” is the movie that I was thinking of: the trailer looked awful, but who knows! I think Lagerfeld directed “Little Ashes” with a screenplay by Ricky Martin and Narciso Rodriguez? And didn’t John Galliano produce? HAHA! I think Laguna is actually pretty good. It’s not a typical fruity floral. It has some similarities to Bvlgari’s Au The Vert (not just the bottle color). For what it’s worth, I think Tania Sanchez gave it 4 stars in the Guide. Maybe it is my imagination, Laguna smelled like a tropical salt water lagoon, languid and calm. I could definitely smell some sort of saltiness about it–probably the ambergris. I appreciated the fact that it was a deep scent, but not awfully cloying. IMAV: I was surprised I liked it so much! This sounds really nice! And the color of the bottle or juice or whichever is that aqua is great. I have been working through that Mark Buxton sample collection I just got from LS and am appreciating his style – definitely male but not just for men. I had to look and see if I still had my at-least-20-years-old mini of the original and yes! I put a drop on and zow! It’s quite something. Spicy, soapy, flowery, dark, nostalgic. Neat stuff. Not going to go in my regular rotation but I will definitely put some on now and again. Ooh, tell us more about the Mark Buxton samples! I was tempted to get those. I’ve got a depressingly small budget to work with right now, so I’m having to be really choosy about buying samples. I’ve only tried two so far – English Breakfast and Nameless. I thought the English Breakfast was going to be tea but it’s not. It opens up very masculine – pepper? bergamot? Might be black pepper that gives me that vibe. Dries down okay – a little sharp. The Nameless is really nice – also a masculine opening, but not as, and the lavender in it gives it a very smooth , skin-scent drydown. Of the two I prefer this. I’ll report in as I go. However, yesterday was Nasomatto Black Afgano day and I liked that one a LOT – very dirty everything, and I can definitely smell a hashy kind of note. I felt a bit illicit. Hmmmm – i would have associated something like Muscs Koublai Kahn with Dali. Not a fruity floral. BTW – did anyone see the recent film, Little Ashes? Any good?!? Interesting reveiw, Kevin. Weirdly, I have a sample of this in my purse right now, courtesy of SF/scentself, and I have “Dorian Grey” syndrome with it. No, it’s not that I spray it and stay young forever – that’s just the phrase my hubby uses to describe something which was original and groundbreaking in its day, which you cannot give its proper due because you experienced all the endless imitators first, and so the original seemed a disappointment by the time you got it. I’m a big fan and long time wearer of the original Salvador Dali Pour Homme, but after the first 2 released (the original Dali for woman and the one for man) the compagny released mostly forgetable generic stuff. Of course, if i come across Laguna I will give it a try…. just in case.